Yesterday was a very special anniversary. It marked the 29th year that has passed since OV-099, the Space Shuttle Orbiter Vehicle Challenger, experienced a catastrophic failure (what NASA calls a Crit 1 failure) during launch, which resulted in the loss of the vehicle and its entire crew. The day was also set aside to commemorate the loss of the Apollo 1 Command Module and its three-man crew during a test on January 27, 1967, and the loss of OV-102, the Space Shuttle Orbiter Vehicle Columbia, which disintegrated during re-entry into Earth’s atmosphere on February 1, 2003, experiencing another Crit 1 failure and the deaths of all aboard. Judith Resnik and Christa McCauliffe a couple of days prior to the fateful launch of Challenger. It was a day to commemorate the loss of these fine people; a day to spend a moment of silence reflecting on the sacrifice they made in their quest to advance the knowledge and, I’d like to think, the purpose of the human race. Truthfully, though I became aware of it on my rocket engine company’s website, I completely forgot about it most of the day and was only reminded when I saw the picture I’m sharing in this post. 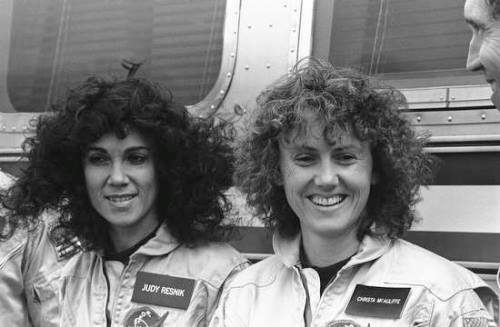 It’s a picture of the two women who were part of the crew we lost with Challenger’s destruction 29 years ago – Judith Resnik and Christa McCauliffe. I came across the picture because Ms. Magazine posted it with some information about these two very special women. They pointed out they were the first women to die in space flight. Judith Resnik was also the first Jewish woman to go into space as well as the second American woman astronaut. Christa McCauliffe would have been the first teacher in space. The death of these women means a lot to me and it should mean a lot to you as well. They died in pursuit of greater understanding, of advancing science. They also were in pursuit of education for the youth of not just America, but the entire planet, as well as the noble goal of space exploration and the known and unknown treasures it promises for our species. These two deaths are especially bittersweet for me, as they were the catalyst that launched what would become my first and, apparently, only actual “career”. Almost one year to the day after Challenger exploded, I began working for the organization that designed and built the Space Shuttle Main Engine and on the document that would represent their portion of the Space Shuttle’s return to flight . . . and service to our space program. I don’t believe I would have found that job were it not for the explosion of that vehicle. I am neither an engineer nor a rocket scientist and, had nothing happened, there would likely have been no need for me.Due to the nature of the document they were preparing to justify a safe return to space flight, they needed people who could work with engineers and rocket scientists and help them input the results of their studies into a document that would satisfy NASA’s requirements of scientific rigidity and organizational accuracy. At any rate, I ended up working for what was then Rockwell International’s Rocketdyne Division. It subsequently became a part of The Boeing Company, United Technologies’s Pratt & Whitney Division, and is now GenCorp’s Aerojet Rocketdyne. I worked there for 21 of the next 23 years, temporarily leaving in a somewhat ill-fated, but important, return to a family business before returning until my retirement in May of 2010. After nearly five years, I am back working there and am hopeful I can make a difference. That my good fortune is somewhat a result of the tragedy that cost these two women, and five other astronauts, their lives does not go unnoticed. I hope I honor their memory each day I do my job. I will never forget their sacrifice, nor will I forget the connection their deaths have with my good fortune. I have few heroes in my life. These two are at the top of the list. This entry was posted on Thursday, January 29th, 2015 at 9:19 pm	and tagged with 51-L, Apollo, Challenger, Christa McCauliffe, Columbia, exploration, explosion, Judith Resnik, launch, NASA, Orbiter Vehicle Challenger, OV-099, OV-102, Re-entry, Rocketdyne, space, Space Shuttle, SSME, teacher, teacher-in-space and posted in History, Personal, Professional, Science. You can follow any responses to this entry through the RSS 2.0 feed. « Just Flew In. Boy, Are My Arms Tired!